In a small bowl, combine the butter, thyme, sage, onion flakes, salt, garlic powder and pepper. Mix until all the ingredients are well incorporated. Place the chicken, breast side up, in a shallow roasting pan. Add the chicken stock to the bottom of the roasting pan. Gently loosen the skin covering the breasts of the chicken, lifting it away from the breast, creating a pocket between the breast and the skin. Pack half of the herbed butter between the skin and the breasts, distributing it evenly. Rub the other half of the herbed butter all over the top of the chicken. Bake on the middle rack for 30 minutes. 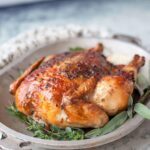 Take the chicken out of the oven, baste the juices over the top of it and return it to the oven. Roast for an additional 30 to 45 minutes, basting every 10 minutes. Roast until it is cooked all the way through, with a meat thermometer reaching 165°F, and the skin is nice and crispy.